It’s been nearly a week since the new flooring was installed. The house is not all put back together yet (much remains to be “unpacked”), but it’s quite serviceable now, and we’re pleased with the results so far. The stress level in the household has gone down ten notches. The most surprising thing was what a big difference the hardwood in the hallway makes. 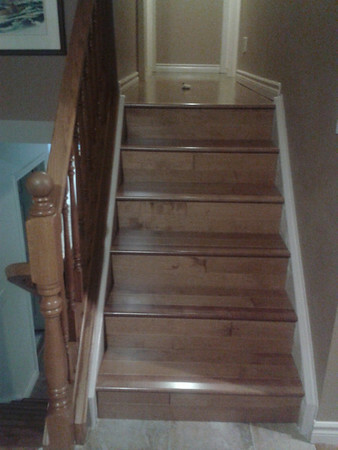 This was more of an aside to the whole thing–hey, why not also have these guys install that hardwood we bought for the hallway years, that’s been sitting under a bed ever since–but they did a great job, and the hallway really looks fantastic. Almost worth the glue smell we’re still trying to dissipate! 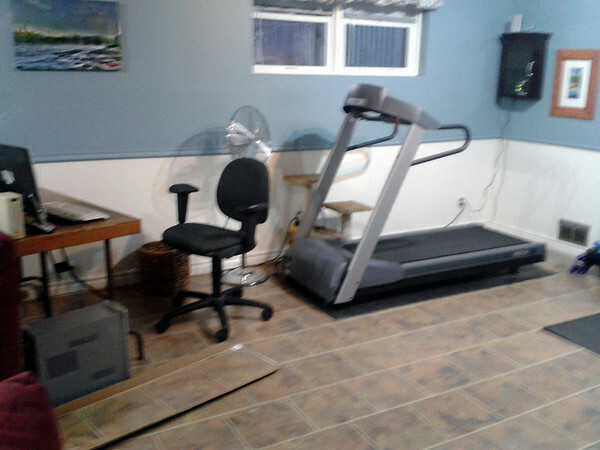 What you can’t see on the other side of the treadmill is my big weight machine. And yes, there is still a computer in that room–the secondary one. It’s a big room, so the other half remains a TV area, with couches, fireplace, and media storage. Even when unpacked, that part is going to look unfinished until we get the new TV purchased and mounted above the fireplace. (Maybe a Christmas prsesent?) And add some more shelving. And, OK, get the fireplace area finished with a stone overlay. But hey, the hallway is definitely all done! Categories: Personal | Tags: fitness, home | Permalink.